Properly fitted Magnifiers are essential for you to perform acceptable electrolysis. Poorly fitted ones will give you headaches, eyestrain, and not allow you to do your best. Well-fitted full-lens magnifiers actually strengthen your eyes. The very step in your training is learning to recognize that the magnifiers you purchased while in Electrology–Electrolysis school that you probably still use today are out of date and have been since they were manufactured. While a student at Miss Kelly’s School of Electrology I was shown a drawer with plastic half lenses with square box magnifiers attached that flipped over. These and similar types cost from $15.00 to $30.00 almost the same when I started school in 1976. For the record after trying them on I found them most uncomfortable and totally unsuitable so I went to the Massachusetts Eye and Ear Infirmary and had specialized pair made with a full lens. After a complete eye examination my magnifiers were fitted with the right frame that made them most comfortable. Prisms were added to each lens to prevent eye muscles from weakening while strengthening your eyes at the same time. Fact, I know seeing is believing and when those hairs look like little palm trees and the orifice opening of the follicle looks like a rabbit hole you have a real advantage inserting that needle down that follicle shaft. Yes, seeing is believing and I have no trouble inserting the needle down a follicle that measures in the thousands of an inch in diameter from .0001, .0002, 000.3 and .0004 and up. In addition to that the patient never senses the insertion of the needle and when looking at the treated hairs they look like little logs lying on the patients face. When you held one up close with the forceps they were glistening root sheathes and perfectly intact from the papilla to the very tip at the end. Perfectly in tact tells you have hit the target. When I observed other fellow students working I noticed how most of them struggled and I asked a few students if I could look through their lenses. The ones with little black square boxes totally limited my vision that hindered my work. After returning them to the student I continued to watch them struggle to do one insertion after the other. I compared all of them to my full lenses most notably students who did not wear glasses complained of eyestrain after only an hour of practical application. Over they years I continued to advance the quality level of magnification and I still see electrologists using the same antiquidated magnifiers. I have tried surgical loops and they only slow you down and some electrologist buy them just to impress their patients. I have observed electrologists who use large mounted stationary diopters, which distort the image and the entrance of and to the follicle. Its 2005 and any electrologist that does not have a custom fitted pair of full lens prescription magnifiers will perform less than acceptable treatments. In addition their patients will suffer from poor insertion and on top of that their work will always be painstakingly slow instead of quick efficient and comfortable. In summation seeing is believing and a pair full lens magnifiers is the requisite first step for an electrologist to be able to perform consistent high quality treatments with ease. 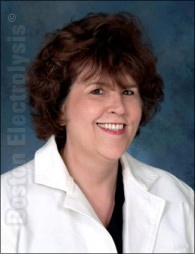 Boston School Of Electrolysis™ All Rights Reserved Copyright 2000 TO 2006.